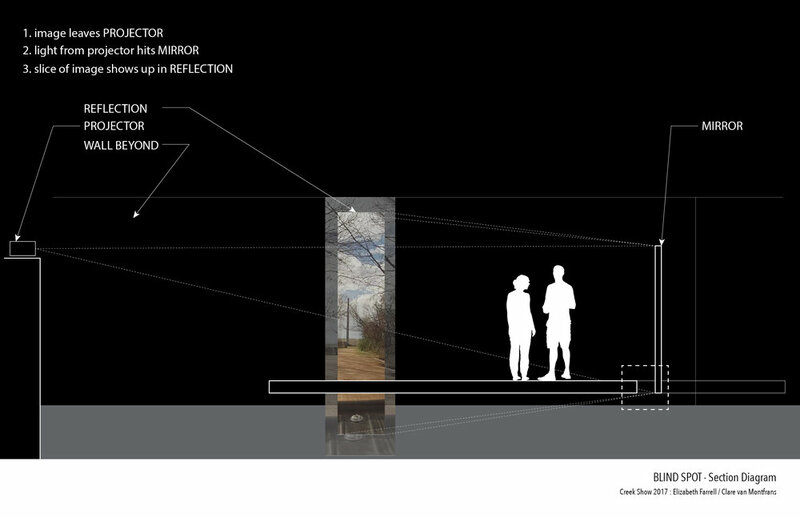 Our installation at Waller Creek, “Blind Spot,” consists of vertical mirrors and projections which superimpose multi-layered visual information on the walls of the creek bed. Each 8-foot tall mirror is fixed at a specific angle decided on site to achieve the desired reflections. A projector is located on each of the creek’s adjacent walls, emitting videos taken while biking around Austin toward the mirrors, the path and the creek. Visitors become part of the installation, adding to the palimpsest of reflections by simply walking through. In developing our proposal, we wanted to highlight Waller Creek Conservancy’s emphasis on making the creek a more pedestrian-oriented place. As bicycle commuters, we often see Austin from the perspective of a bike saddle and we wanted to bring that frame of reference to our installation. Biking around the city, a cyclist must constantly assume she is invisible, hidden in the driver’s blind spot. Similarly, Austinites pass over Waller Creek on a daily basis without noticing it. “Blind Spot” superimposes the bicycle on the creek bed, creating a space within the city where visitors are invited to consider the potential of both. Our intention is that this installation will shed light on aspects of Austin life that are often overlooked and initiate a dialogue about the importance of investing in the urban, people-oriented spaces of Waller Creek. An important component of “Blind Spot” was the projected videos of cycling in Austin. Leading up to the installation, we captured footage of cycling in Austin via GoPros mounted on our bikes. Below is the final video compilation.